The delicious protein bar for more performance while exercising and for in between. The 32 % protein core is coated by a layer of creamy caramel and crispy chocolate. One of the most tasty fitness bars on the market! Being made in Germany, cardiostrong sports nutrition is subject to strict ingredients control. Due to it, the high quality of the cardiostrong products is guaranteed. It is shown, i. e., in the high biological quality of the ingredients. Thus, the Multi Protein 80+ contains high-quality egg protein instead of soya protein. The Isolate Protein Thermo is perfect for muscle building and definition thanks to the combination of protein and Thermogenic Fat Burner. 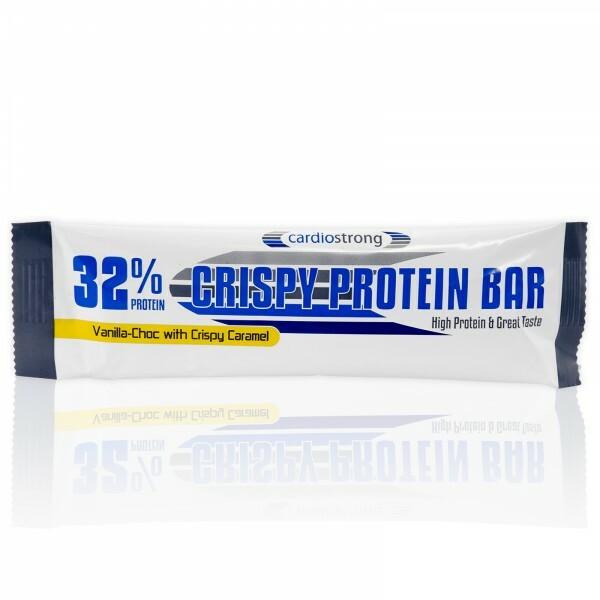 And the tasty cardiostrong protein bar is simply unbeatable as a snack full of proteins.